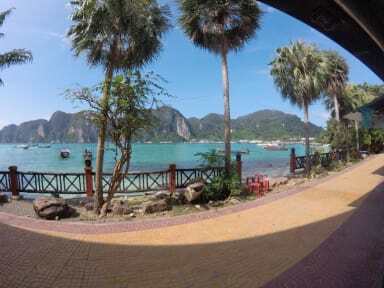 Coma Hostel & Travel Agency i Koh Phi Phi, Thailand : Boka nu! I really loved my stay att coma, the owners and staff are really nice and helpful and try to make your stay the best it can be! The rooms and bed are very clean. The location is awesome, when you step out the door the view is amazing, really recommend it! Fabulous experience at this hostel; from the owners, to the location, to the privacy curtains on all the beds. I have stayed in 3 different hostels on this island and this was the first one that actually had real mattresses on the beds as well as curtains so no one could see into your bunk at night. Good aircon, great location just a 5 min walk from the bars. No noise at night. Met many awesome ppl too. Definitely recommend. Owners hooked me up with free vodka shots & discounted boat ticket! We loved our stay at Coma hostel, Jason the owner gave us an introduction of the island aswell as a few free shots 😅. It’s quite pricy for a hostel but after all it’s an expensive island overall. We also met people there we ended up spending the following days with. Capsule-style a la Thailand. You get your curtains and privacy but everyone have to pass by your capsule to get to the toilet/showers. Extremely small, no place for sitting or even standing around. If you just need somewhere to crash and not hang out, this is a good spot. Big lockers to fit more than a large backpack, bring your own lock. Staff will help with any tour reservations or ferry tickets. Clean bathrooms. Nice staff. Good location, a bit away from the party and loud stuff. Only 5min walking there tho. A bit expensive. Personalen var otrevlig och lig aldrig. Sov en natt helt ensam på hela hostelet så är ingen bra plats om du vill träffa nya människor. Därutöver är rummen smutsiga med myror och andra smådjur som kryper runt på både sängar och golv. Läget var inget vidare heller, särskilt om du vill ta dig till festerna på andra sidan ön.